Time to tune in to Tapati! Phil Fersht (CEO, HFS Research): Welcome Tapati! Can you share a little about your background and why you have chosen research and strategy as your career path? Tapati Bandopadhyay (VP Research, HFS Research): First of all, thanks for giving me this opportunity Phil, to get back to my favorite world of analysts and research, in a firm that can make any enthusiastic 40+ feel like a 20 something again! I have been a nerd all my life, and very proudly so. I wrote my first year PhD exams when my girls were 2 and 1-year old and I used to study for the exams from 12 to 4 at night and loved every moment of it. Even now, I cannot get sleep if I don’t read at least 20 pages of something completely new, something to anticipate and to be excited about when I wake up the next morning! In last ten years I have probably taken the Strength-Finder 2.0 test at least three times, and each time my top two strengths remained exactly the same: Futuristic and Analytical. I think I am destined to be a research analyst and strategist! The upside of it has two key aspects: 1- analysts are future-makers, if we don’t push the real to the imaginary and back, the art of the possible is not likely to transform into the science of the real anytime soon; and 2- in addition to being future-proof and creatively bot-proof, analysts’ jobs are also recession-proof, as we can apply our analytical skills to find cheaper ways to do things with same or even better quality. What are the areas and topics that you’re focusing on in your analyst role with us? AI is my area of strength and there’s so much going on currently that I think we in the research and analyst world have a great responsibility right now, to clear up the clutter and let people focus on what’s real vs. what’s plain hype. Never losing sight of the Big Picture is becoming increasingly difficult in this technology-blurred world of “AI-defined everything”. While I love all the math models and algorithms and routinely devour new research papers in areas like deep belief nets, XAI, NLG, or imagination augmented AI, ultimately we have to keep it simple and human-centric. Only then all this technology hullabaloo will start making real business sense. AI and IoT are highly connected, especially with 5G becoming mainstream in 2020 and even 6G at the works to come in by 2025-2028. Therefore I will be quite actively tracking the IoT space, chasing Nicola Tesla’s 1926 dream of creating a world-wide human-machine combined brain, which will become real when we achieve the next level of HFS OneOffice- the hyperconnected intelligent enterprise. Talking about Things, I will cover the manufacturing and industry 4.0 research agenda too. I have always loved machines- be it those mammoth hydraulic presses at the Tata Motors truck factory, or the precision drilling machines at GEC Marine Glasgow. Manufacturing is truly the parent industry where tangible economic value gets generated with the land-labour-capital inputs. Only, the labour is now the ‘phygital’ workforce- with smart machines augmenting our quality of work and productivity, while freeing us up from loads of hazardous or boring tasks. That’s where AI, IoT and industry 4.0 connect beautifully in my mind-map, creating a simulated digital twin of the physical machine-world. What trends and developments are capturing your attention today in technology and business operations? I take what Andrew Ng said about data being the new oil, to data becoming the new glue, the invisible ‘ether’, the collective grey matter of the world. In sync with what you envision about the next OneOffice becoming ubiquitous in a hyperconnected world, the data oligopolies that we all know to exist today will come crashing down. We have already seen this happening just as the entry barriers to AI algorithms went down with the cloud-based pay-as-you-go models, and the entry barriers to top talent got broken in an open world of millennials comfortable in crowdsourcing. Now, with machine learning itself becoming partially autonomous, with unsupervised learning in a limited way and then with AutoML, human learning will also have to undergo transformation, where enterprises will learn from each other’s data, intelligence, experiments, experience, and thrive in a fairly co-opetitive world of frenemies where ultimately mankind and the unsuspecting individual, wins. Is the analyst industry much different now than when you were at Gartner a few years ago? What is changing in your opinion, Tapati? I think the analysts in this agile, new-age, ‘open research’ side of the world, are far more than mere subject matter experts. We are bolder, actionable and direct, hands-on folks, been-there-done-that type, and I love it. We are also listening better, to build our perspectives from a 360 standpoint. Not just technology, not just business, but the ability to cover all aspects, keeping the end-customers at the centre. Because, whatever be the industry or technology, if the end-customer is not impacted, nothing else matters. So I see three key changes: 1- the idea of open research and collective intelligence, given that even IBM and Microsoft have now become proponents of open models; 2- the cognitive agility- to think fast and slow as the situation demands, and 3- to be direct, actionable and relevant with a holistic perspective – keeping the end-customers at the centre of any value universe. So, Tapati, what are you working on first for our clients? I am planning to cover the practical aspects of applied enterprise AI, as I have experienced this freshly and first-hand and have learned a lot. I have some very strong views and counter-views, on how these AI algorithms and their applications will pan out in the immediate and intermediate future, and the subsequent to-do’s. We will have to stay ahead of the curve. Hence I plan to share these as predictions and actions kind of PoV’s. I will also be covering the IoT and industry 4.0 with our India team along with the global team. And given I have the locational advantage of being based out of India- the services factory of the world, and especially in Bangalore- world’s no. 2 silicon valley, I will work with a lot of tech start-up’s and service providers on their AI and automation initiatives, and IoT and manufacturing vertical practices. And, what do you do with your spare time (if you have any...)? Oh, I have to try very hard to play the cognitive catch-up game with my three children - my teenage girls and our 3-year old German Shepherd – named after our most fav physicist Dr. Feynman, we most humbly accept the fact that he is the smartest in the family. I love to read physics books and fictions by the likes of Archer and Grisham, but I get constantly rebuked by my girls on not reading enough. Therefore I always try the easier way of asking them questions and then listening to every word of wisdom that they have internalized, post reading the tough non-fictions. I also love to paint and play Indian music on the piano. And I love to cook for our friends and family. So next time any of you are in Bangalore, you have to come prepared. It’s a statutory warning- there’s no getting away from my unique cuisine while you’re here! 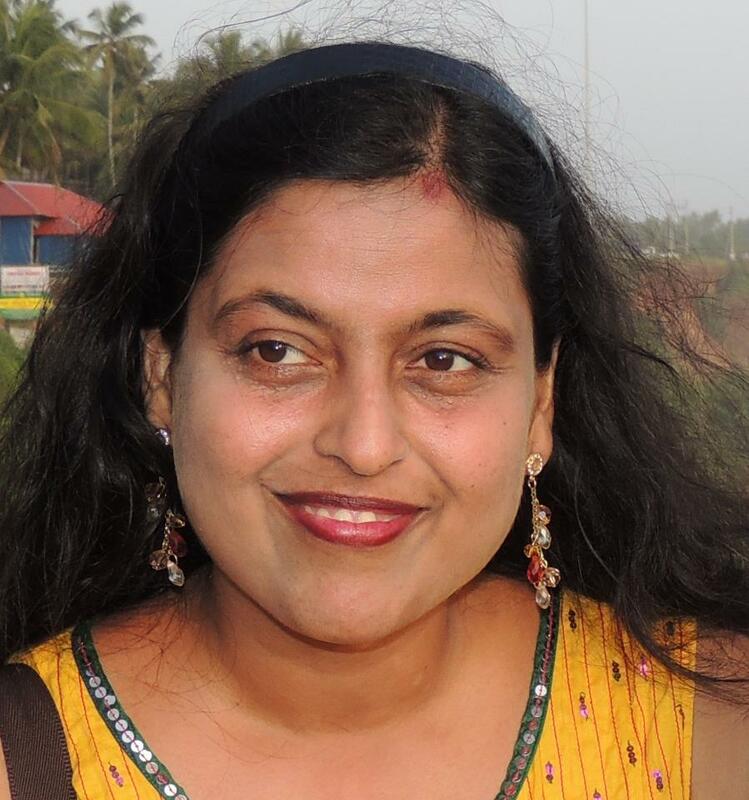 Tapati Bandopadhyay (pictured above) joins HFS research to lead our India research operations and expand coverage of AI and IT services. You can read her bio here. Wow! Congratulations Tapati! I'm sure HFS will immensely benefit from your knowledge and experience of predicting technology and changing human behavior and expectations. All the best in your new role!! !